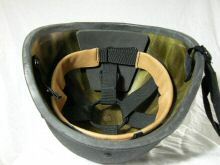 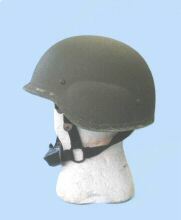 CORLON HELMET, widely exported and given a number of different designations, with manufacturer label. 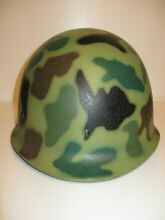 This is surprisingly unusual. 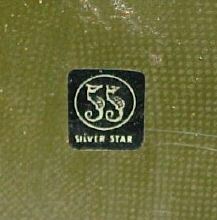 Silver Star logo - Silver Star is a Korean manufacturer which also made PASGT-type helmets for Singapore. 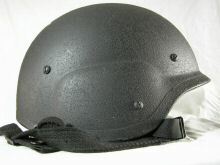 Copy of PASGT type in kevlar. 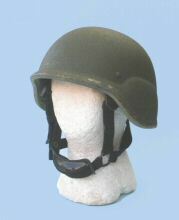 SOUTH KOREAN EXPORT HELMET ? 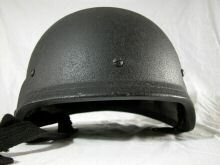 "There are no stamps, moulding, or any other identfication marks in this helmet. 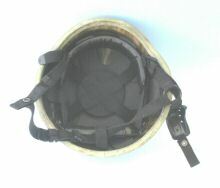 In fact there is nothing to show from whence it came or where it is used. 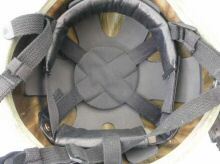 So far nothing like it has been found, except for an Indonesian-used composite with some similarity but not identical. 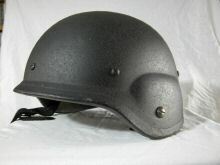 It has some characteristics in common with well-known SK export helmets, so has been placed here for want of any better ideas." 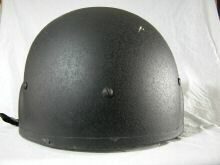 UNKNOWN HELMET - Maker unknown, date unknown. 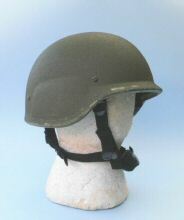 Believed to be a South Korean product. 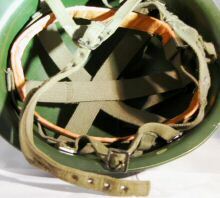 The two photographs below are contributed by ARTHUR BENJAMINS. 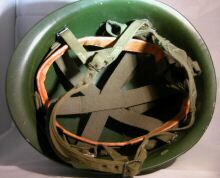 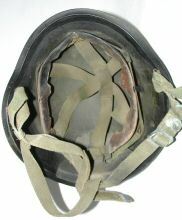 Taken from a helmet identical to the above except for a different crown moulding (AL-6 rather than AL-5) and with a 'MADE IN KOREA' sticker in place. 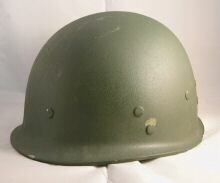 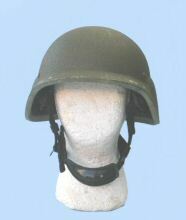 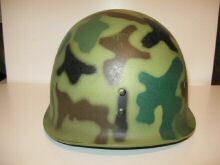 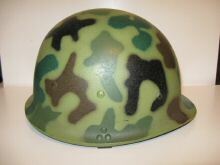 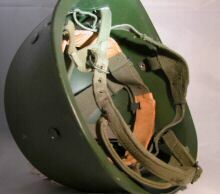 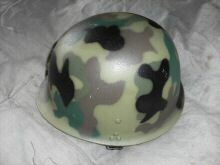 probable SOUTH KOREAN - in almost every way identical to the helmet shown above, believed to be a Korean product. 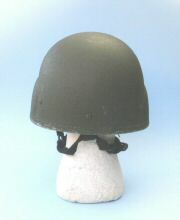 This one was previously featured in the 'Unknown' section.? 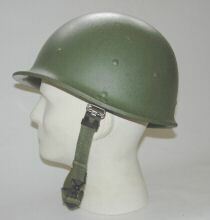 Obtained from the Brecon militaria fair, tagged as a 'Special Forces' helmet, which seems unlikely. 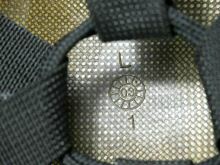 There are no markings of any kind except for a logo pressed into the crown, a sort of clock-face logo divided into 12 rectangles, which has '03' in the centre, and a tiny dot in the second sector round from 12, which may mean February. 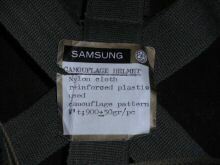 Therefore February 2003 ? 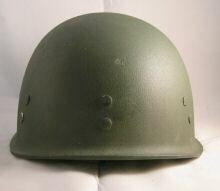 There's also a L for large (probably) and a 1, which could mean anything. 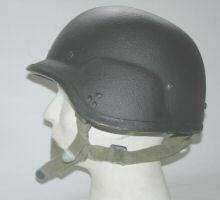 I have checked through a lot of photographs and using what I thought was a clue - the very basic fabric chinstrap with a pop-stud fastener at one end - I feel that it could well be a South Korean commercial model, and from the black finish one aimed at police or other civil organisations rather than the military. 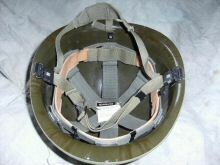 I certainly have photos of South Korean helmets - unfortunately not properly identified - which have an almost identical chinstrap. 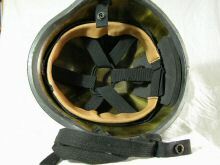 The 'para'-type nape pad which is fixed to the liner straps with a little slot in the pad itself also seems characteristic of a South Korean commercial product. 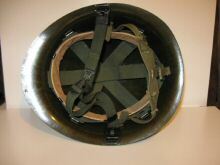 Apart from these partially-educated guesses - which could to totally wrong - I've no idea what this really is. 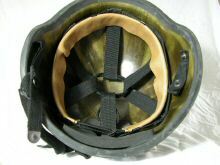 Can someone help?